This article presents legendary UCLA coach John Wooden's DVD and book entitled "John Wooden's UCLA Offense", and serves as an introduction to Coach Wooden's UCLA offense. Coach John Wooden, "the Wizard of Westwood", coached his teams to ten NCAA championships in his last twelve years of coaching during the 1960's and early 1970's. Coach Wooden's views on basketball and his philosophy on life itself are inspirational. This product is a wonderful book and DVD combo presented by Coach Wooden and Swen Nater. Coach Wooden goes through everything about the UCLA offense in the DVD, and the printed text and diagrams are all included in the book. It's really a pleasure to watch this DVD and Coach Wooden explaining every facet of his offense in detail. His attention to detail and preciseness are important reasons for his tremendous success in life. This is a "must watch" DVD for any serious basketball coach. This article serves as an introduction to the UCLA offense and discusses the High Post Offense and the High-Low Offense. Not discussed here, the DVD/book also includes Coach Wooden's methods for attacking pressure defenses, both half-court, 3/4 and full-court presses. Additionally, a number of Coach Wooden's set plays are included, not only half-court plays, but also his favorite baseline and sideline out-of-bounds plays. Many drills for teaching the offense are presented. A final discussion by Coach Wooden on "Teaching and Coaching" is priceless. So if you are serious about using the UCLA offense, you must get the DVD and book. Rebounding Balance - the UCLA offense usually results in a rebounding triangle under the basket when the shot goes up, and one player as a long rebounder and one safety. 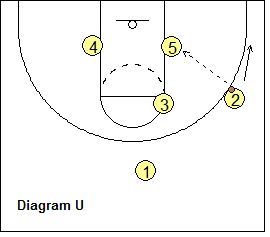 The UCLA High-Post Offense is an offense used against man-to-man defenses. Diagram A shows the basic 2-3 high set (two-guard front). 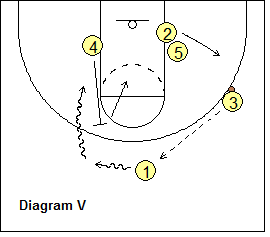 The low post O5 will start low but then flash to the high post to receive a pass. 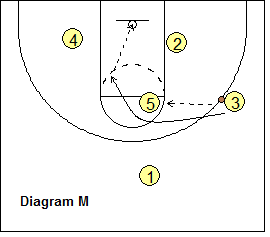 This high set, like the 1-4 high set, takes defenders away from the hoop. If you have tall guards, this offense allows you to post up your guards, and with a two-guard front, there is less pressure on your point guard, as the offense can be run to either side. The offense usually starts with a guard-to-guard pass (diagram B). The receiving guard O2 should be a little behind the passing guard O1, so that this pass does not get intercepted. After the pass to O2, O2 has the option of passing to either O5 in the high post, or to O3 on the ballside wing. 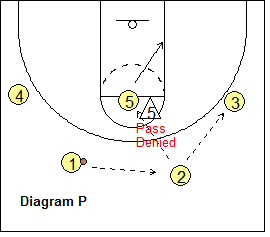 First, we'll discuss the pass to O5 in the high post. When the ball is passed to the high post, the forwards O3 and O4 quickly back-cut to the hoop for a possible pass from O5 and a lay-up (diagram B). As the forwards cut inside, the guards O1 and O2 V-cut in toward the middle and then cut out to the wings. O5 could pass to either wing, but diagram C shows the pass going to O2 on the right wing. 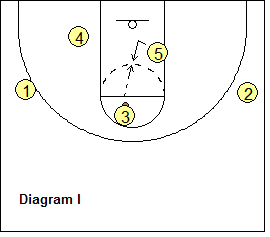 The wing O2 then looks to pass inside to the forward O3 posting up. O5 cuts inside for a possible pass from O3, and if the pass is not there, O5 down-screens for the opposite forward O4. 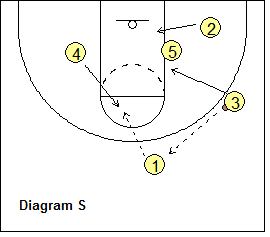 O4 cuts around O5's screen into the lane for a possible pass from O3 and the shot. Notice also that whenever a wing player passes into the low post, he/she re-locates to the ballside corner for a possible pass back out and a 3-point shot. The defense may expect the guards O1 and O2 to v-cut to the wings. We can change this up. Diagram D shows the option of the guards criss-crossing to the opposite wings. 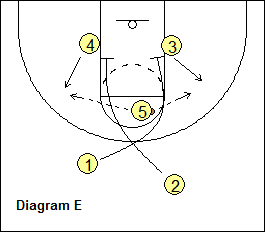 Diagram E shows that O1 and O2 can scissors-cut around O5 and then both set down-screens for the forwards O3 and O4. 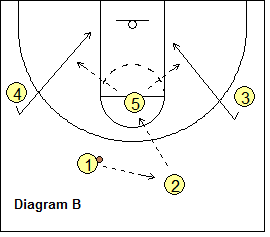 O3 and O4 cut around the down-screens and either player could receive a pass from O5 for a jump-shot. Diagram F shows yet another option. Here, one guard O2 cuts to the wing and the other O1 cuts inside and sets the down-screen. O5 could pass to either O4 using the down-screen, or to O2 on the wing. 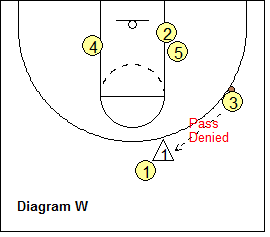 If the pass goes to O2, O2 looks to pass to O3 in the low post as seen previously. 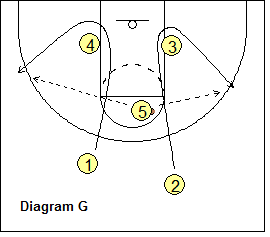 Diagram G shows another option with the guards cutting inside and curl-cutting around O3 and O4 for a possible pass and outside jump-shot. The guard O1 also looks to pass inside to O4 posting up (diagram H). 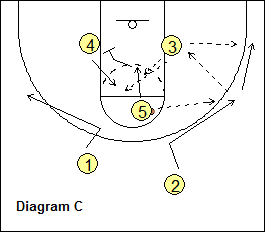 On the pass to the guard, O5 down-screens for the opposite forward O3. 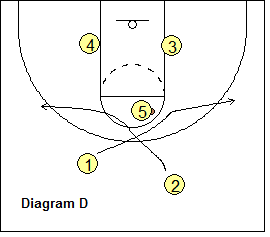 O1 could shoot, or pass to O4 or O3 at the high post. 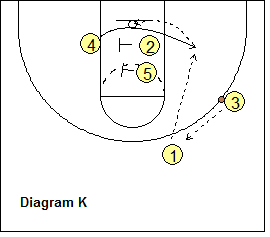 If the ball is passed to the high post, O5 ducks in and O3 looks to go high-low with O5 inside (diagram I). Diagram J shows O1 passing to O2, and then the guard to wing O3 pass. Notice that O3 initially cuts inside and then back out to the wing for the pass from O2. 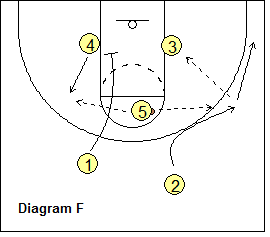 The opposite forward O4 still makes the usual cut inside to the opposite low block. The passer O2 cuts outside and around O3. Next, diagram K shows O2 and O5 setting a double-screen inside for O4, as O3 passes back out to O1 (who has moved to the top right position). 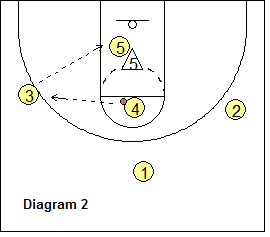 O1 passes to O4 cutting under the double-screen for a pass and jump-shot. Diagram L shows another option here. O5 stays at the high post and receives the pass from O3. 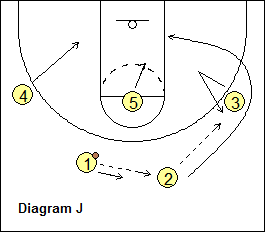 O3 then down-screens for our shooter O2, and O2 uses the screen to get open and gets the pass from O5 and the jump-shot. Diagram M shows yet another option. 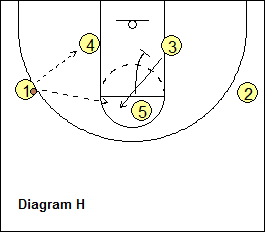 O3 passes to O5 at the high post, and then O3 cuts around O5 for a possible hand-off and jump-shot. In summary... diagram N shows the two passing options for our guard receiving the guard-to-guard pass (here O2). He/she can pass to either the high post O5, or to the forward O3 and cut around outside O3. Diagram O shows the defender X2 denying the initial guard-to-guard pass in hopes of breaking up the normal flow of the offense. 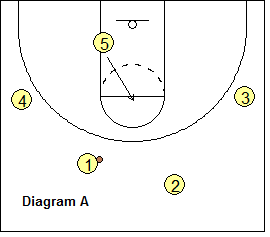 Here, the weakside forward O3 immediately recognizes this and, after initially cutting inside, cuts hard up above the free-throw line to get the pass from O1. O2, who is being over-played by X2, then back-cuts around O3 for a possible hand-off and lay-up. 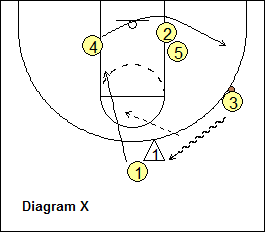 Diagram P shows the defender X5 denying the pass from O2 to the high post O5. To counter this, O5 cuts down to the block, and we run the guard-to-wing pass option with the guard cutting outside and around the wing (as previously seen). 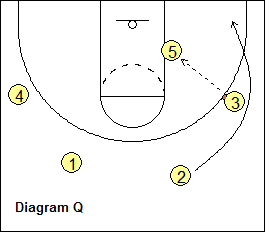 O3 looks to pass inside to O5 posting up (diagram Q). Diagram R shows O3 and O2 running a "low post split", cutting around O5. Diagram S shows another option here. Instead of passing into O5, O3 passes back out to O1. 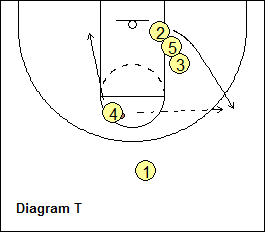 The opposite forward O4 flashes to the high post and gets the pass from O1. Meanwhile, O3 and O5 sets a double-screen inside for our shooter O2. O2 uses the double-screen and gets the pass from O4 on the right wing, and O2 could take the shot. After O2 cuts around the double-screen, O3 moves up to the ballside elbow. O2 could pass inside to O5 posting up (diagram U). Let's back up to where O3 has the ball on the wing. 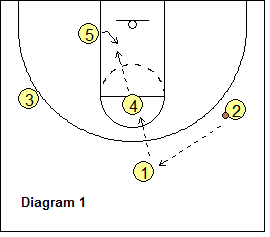 Another option after O3 passes to O1 on top is to have O4 come up and ball-screen from O1 (diagram V), and O1 and O4 run the pick-and-roll. 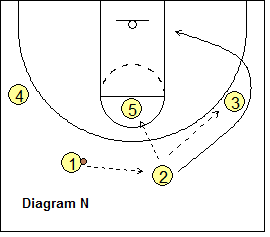 O1 can help set this up initially by making a couple dribbles over to the left. Notice also that O2 still cuts around O5's screen, clearing out help defenders and creating some action away from the ball which might get the defense's attention. 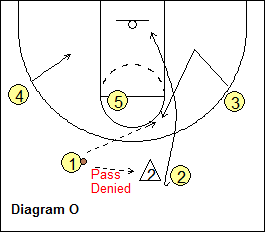 If the wing-to-guard pass is being denied (diagram W), O3 simply dribbles directly at O1, and this "dribble-at" triggers O1 to back-cut (diagram X), for a possible bounce-pass from O3. Notice that O4 clears out around the double-screen set by O2 and O5. 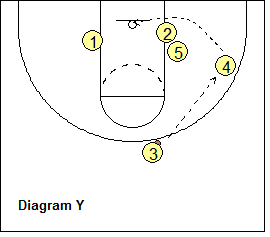 Diagram Y shows O4 cutting around the double-screen and receiving the pass from O3 for the jump-shot. For a number of years, UCLA had great big men (Lew Alcindor - Kareem Abdul-Jabbar, Bill Walton, etc), and Coach Wooden wanted the big man to get the ball inside near the basket, rather than at the high post as seen above in the High-Post Offense. 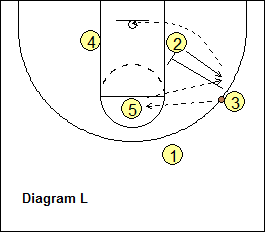 The Low-Post offense accomplishes this while often also avoiding double and triple teaming the low post player. The High-Low offense is started once again with the guard-to-guard pass (O1 to O2 here), and then O2 dribbles to the wing. O5 cuts down to the opposite block and O4 cuts inside and then back up to the high post. O2 passes back to O1 on top (diagram 1), and O1 passes to O4. 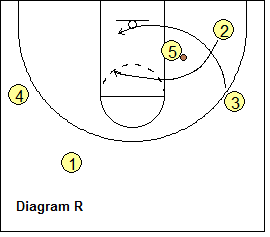 O5 ducks into the lane for a post up and a hi-lo pass from O4. If the X5 defender is fronting O5 (diagram 2), O4 passes to O3, and O3 passes to O5 sealing X5 high. 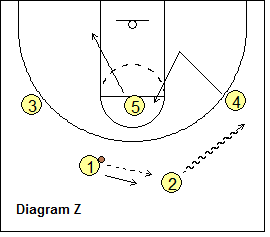 Notice that we have gone from a 2-3 set (diagram Z) to a 1-3-1 set (diagrams 1 and 2) with this offense. As we can see from above, the UCLA offense(s) has some pattern to it, but has many options and counters that break the pattern and make it more difficult to defend. Players must be drilled in offensive fundamentals and must be taught how to read the defense, in order to execute the correct option or counter. The DVD demonstrates many of the drills that Coach Wooden used for this purpose, and are not discussed here. The DVD also has a section on the UCLA press attack... for attacking full-court, 3/4 court and half-court pressure. A number of Coach Wooden's set plays are also presented... which might be the basis for a future article.